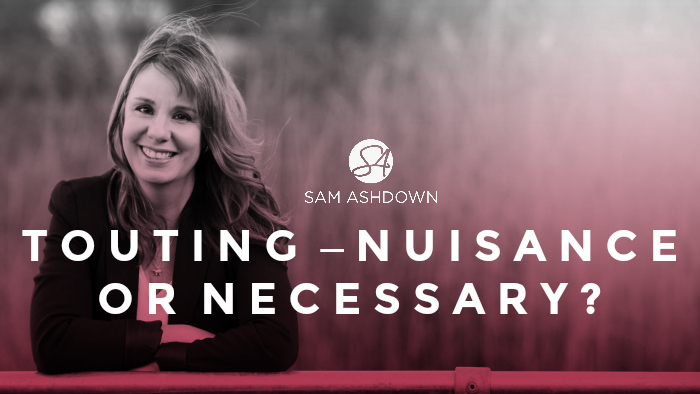 Touting – Nuisance or Necessary? What’s your take on touting? Do you do it? Does it work? Is touting a sleazy underhand way to get business, or a vital and lucrative element of your marketing mix? Most agents consider touting to be an essential part of their marketing strategy. Some see a competitor’s board as an implicit invitation to try to poach that instruction, and in certain high property value areas, vendors often get bombarded with touting literature, especially when stock is low. “Touting can be really effective if you have a sincere marketing plan and genuine belief that you are the better agent who can maximise the price for them in the timescale they want. People tend to be happy to pay your fee if you do what you say you will and present yourself as someone who can help. I find it successful because I genuinely believe we’re the best in our area at customer care and selling houses! “It’s one of the main reasons the industry has a bad name. I’d estimate that 98% of touters run a negative campaign that runs down the instructed agent rather than a positive one. It reinforces the perception that all agents dislike each other, which makes it easier for savvy vendors to play one off against another, resulting in lower fees. It also disrespects the agent’s instruction and undermines the decision of the vendor. Most of the agents who have a systematic touting process do not target old instructions; they start immediately the new instruction comes to market and before the instructing agent has implemented their marketing strategy. I believe estate agency is unique in this regard. How many times have you analysed an agent’s portfolio? They may have 50+ unsold instructions yet want to pinch someone else’s. “We run a bespoke, small, independent agency, and have benefitted from other agents touting, rather than touting ourselves. Client feedback has told us that most people find touting intrusive and aggressive and have come to us because we don’t partake in rivalry. Really, it all comes down to trust, and truly trusting an agent is a difficult step to take. A challenge agents face with touting, is the tendency to over-promise, under-deliver, and often, under-charge too. Promising a vendor that you’re going to do a better job of selling their property than their current agent is doing, then failing to deliver on that promise, can damage your reputation more than not taking it on in the first place. Especially as in my experience, touting agents tend to also under-charge, offering to beat the current agency fee as an added incentive to the vendor to switch. When every agent is trying to portray themself as different from their competitors, and to prove that differentiation in their marketing activities, how does touting help or hinder with that aim? “I’ve spent a long time in corporate agency before setting up my own business and one of the very first things we decided at Madison Oakley was never to tout other agents properties. Along with many other things we don’t do…. we have always taken the stance that we should be seen as different to the rest and we know that the vast majority of clients can’t abide touting letters and cards through the door. We are surrounded in Bath by large corporate agents who spend a goodly portion of their lives bombarding people with badly designed literature and our properties are constantly targeted (at last count, we had seven different cards or leaflets through one door in a week). Supply levels in Bath are ultra low at present (and have been for a while) so I see the cheap suited lot hustled out onto the streets by their managers almost every day. However, in 5 years, we have only lost one property to touting. I know touting works to a point – I spent over a decade doing it – but I really don’t think you get quality business from it. Harassing an owner into changing agents doesn’t, in my opinion, start off the relationship on a good footing and reinforcing the general public perception of our profession in this way is never helpful. I know we stand out from the crowd because we don’t do it and I when I mention this on valuation, I always get a hugely positive response. I’m mostly underwhelmed when I examine the products some agents tout with – we have seen the usual..…“Call Me” fake business cards again recently and the majority of others are badly phrased in house printed “We have noticed your property is still for sale” letters. We do have a couple of agents locally who deliver decent glossy leaflets and, in one case, a brochure pack you could choke a horse with but most of it still ends up in the recycling bin anyway. The type of client I want is one who has chosen their agent for good solid reasons, trusts us to do our best and values our relationship. In my opinion (and based purely on my local experience), agents that tout do so because they are a) desperate, b) told to and/or c) haven’t got enough selling points to stand out any other way. Ok, so the jury is generally against touting, but are there any circumstances in which touting is acceptable, and even, desirable? When a vendor first puts their property on the market, they are going to view any touting letters they receive as an annoyance. Clearly, there is a tipping point when that contact stops becoming an intrusion, and instead starts offering welcome hope that your agency could actually do things better. When you’ve been invited out to a market appraisal, but failed to win the instruction, perhaps touting is more palatable to the homeowner. These ‘lost instructions’ merit a nurture campaign, to keep that seller warm and therefore much more likely to come back to you if they don’t get a good, early offer. What do you think of touting? Love it or loathe it, it’s very much part of the industry these days. You don’t have to participate, but if you do, make sure you’re acting in a professional manner, remaining above reproach and criticism, and not just trying to poach the business at any cost to gain market share for the sake of it. Touting has been a hugely valuable tool for us that’s help us take AshdownJones from nothing to the leading agent for premium homes in the Lake District. A practical, step-by-step video training programme to help you get your direct mail and canvassing working for you to bring in new, quality vendor and landlord leads every time you send out a campaign. Delivered over 6 video modules, you can work through them at your own pace, with your team, and return to them as many times as you need to, enjoying lifetime access. Just go to my DIY Marketing Courses page where you’ll find more details of Canvassing that Converts programme and you can decide if it’s right for you. If you’d like to ask me any questions before you go ahead, just message me here and I’ll help you make your decision. And like with all my courses, you have the complete reassurance of a 90 day money back guarantee if you don’t love it. Previous post What, no stock?